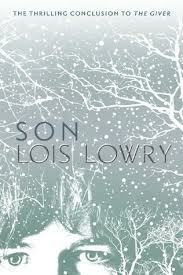 Son is the final installment in The Giver series. The narrator is a birth mother, Claire, from the colony which Jonas came from. The opening scene is Claire giving birth. The process is strange, she is blindfolded to keep from bonding with the "product". Lowry's comment on this is haunting, "Her name was Claire. She was fourteen years old." We then back up a bit to give Claire's character some history. She was disappointed in receiving the job that she did. Birth Mothers are not held in high esteem in the society; they birth three children then are sent to perform manual labor until they are old enough to retire. Claire's labor was difficult, there was a c-section performed on her, she was told that she would be assigned to a new job as she would no longer be able to give birth. Claire asked if the product was ok, she was told that he was fine. Claire knew then, that she had a son. I enjoy reading about the modern society which Claire and Jonas come from, more than the villages in the second and third installment of the series. For that reason, I would consider Son my second favorite out of the series. This is not what I would have expected out of a final book in a series. I thought there would be a deeper understanding of the world around the characters. I want to know why things are the way they are in the series. How many civilizations are there? Why aren't they the same if they are so close in proximity. I would love to have understood more.